A well-attended hot topics session at SPIE Photonics West on progress in the U.S. BRAIN (Brain Research through Advancing Innovative Neurotechnologies) Initiative featured speakers from federal agencies, academia, and industry. The session was sponsored by the National Photonics Initiative (NPI) Neuroscience Task Force. 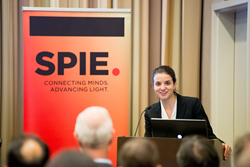 Noemie Levy of the OSTP was among speakers at a BRAIN hot topics session 14 February at SPIE Photonics West in San Francisco. NPI has given individuals and companies that work with light a coherent voice in explaining photonic technologies that can greatly benefit biomedicine. Not enough is known about how the brain works – yet – to meet major challenges facing the world in this century, Ned Talley told the spillover audience of more than 150 gathered for an update on the U.S. BRAIN Initiative Sunday afternoon at SPIE Photonics West in San Francisco. Talley, a program director with the National Institutes of Health (NIH), was one of several agency, academic, and industry speakers reporting on the initiative’s progress in a “hot topics” session sponsored by the National Photonics Initiative (NPI) Neuroscience Task Force. SPIE, the international society for optics and photonics, and The Optical Society (OSA) are Founding Sponsors of the NPI, a collaborative effort to advance photonics to help maintain competitiveness and national security. Launched by President Obama, the BRAIN (Brain Research through Advancing Innovative Neurotechnologies) Initiative is needed to help address major chronic non-communicable diseases and costly, disabling brain disorders, Talley said. The initiative is a coordinated effort among NIH, the National Science Foundation (NSF), academia, and industry, said Noemie Levy Senior Policy Advisor for Partnerships in the President’s Office of Science and Technology Policy (OSTP), “convening people who might not otherwise work together.” The OSTP has enabled exploration of how policy and programs might advance the initiative, but most of all, its role is to listen to the community, learn about needs, and help set the tone. Earlier in the afternoon, SPIE Director for Industry Development Stephen Anderson accompanied Levy on a tour of the world-class SPIE BiOS Expo, giving her a chance to hear from representatives and see displays from companies developing innovative photonics technologies that will be key to enabling our future understanding of the brain. The NIH has developed a formal program for public-private partnerships, Talley said. Last year, the agency spent $85 million to support 125 projects, and its budget is $150 million for 2015, the second of what is hoped to be a 10-year program. So far, he said, the initiative is receiving strong bipartisan support in Congress for funding. Fallahi said that in addition to funding U.S. programs, NSF is collaborating with similar United Nations and European projects. Lin and Schnitzer described progress in mapping brain function, work which is enabled by several photonics technologies and applications, such as sensors, lasers, and imaging devices. Industry speakers stressed the role of collaboration in developing applications, including the work of scientific societies to move the conversations forward. “Thanks to the NPI, we have guidelines to help us consider lasers for specific needs,” said Coherent’s Arrigoni. The Optogenetics conference is part of a program organized by Rafael Yuste, Columbia University – one of the advisors who helped conceptualize and launch the BRAIN Initiative. The program also includes conference on Clinical and Translational Neurophotonics, and Neural Imaging and Sensing. The National Photonics Initiative (NPI) is a collaborative alliance among industry, academia and government to raise awareness of photonics and the impact of photonics on our everyday lives; increase cooperation and coordination among US industry, government and academia to advance photonics-driven fields; and drive US funding and investment in areas of photonics critical to maintaining US economic competitiveness and national security. The initiative is being led by top scientific societies including the American Physical Society (APS), the IEEE Photonics Society, the Laser Institute of America (LIA), The Optical Society (OSA) and SPIE, the International Society for Optics and Photonics. For more information visit: http://www.lightourfuture.org.